I know, I know, I've been sharing a lot of recipes lately, and it's really about time for a restaurant review or something. 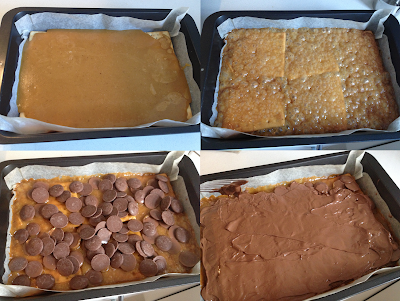 But when a workmate brought these crunchy chocolate caramel slices in, and I found out how easy these moreish mouthfuls were to make, I decided they would be perfect to include as part of the Sweet New Zealand monthly blogging event. Caramel crunch with a variety of toppings. The last time I wrote a post intended for the event (I was too late with the entry), I made chocolate cheese fudge. It turns out a savoury component works a treat in desserts. In the case of this caramel crunch recipe, the secret ingredient is... wait for it... Salada crackers! Not surprisingly, I've seen this addictive invention labelled Christmas crack. I prefer to watch people's reaction to these little bites before they know what is in them, so I avoid using names that give the game away, like soda cracker chocolate candy, salty caramel and chocolate crackers, or saltine cracker brickle. 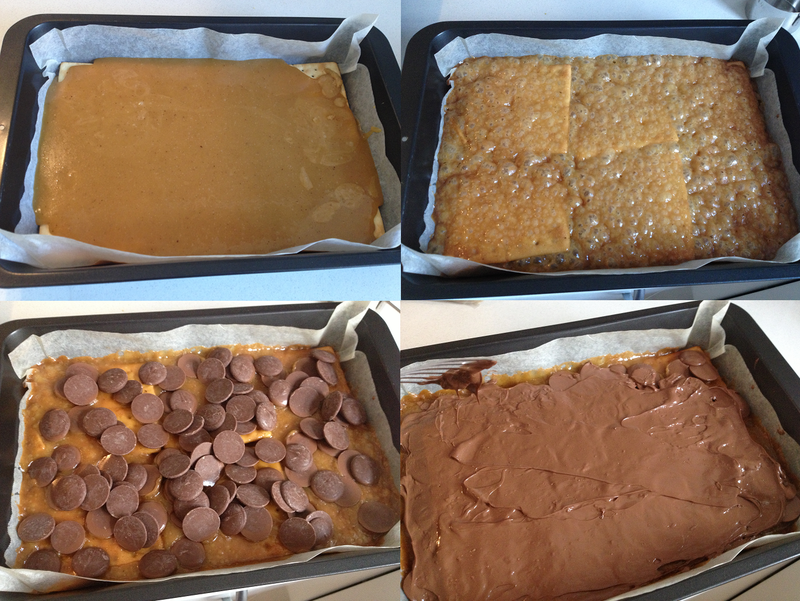 Instead, I'll call them caramel crunch bars, chocolate toffee bark or salted toffee chocolate squares. There are any number of variations, not just in the name, but also in the toppings. You can add nuts, dried fruit, flaky sea salt, or more sweet and/or crispy things, like broken pretzels, hundreds and thousands, chopped M&Ms or mini marshmallows. They are also great with no toppings at all, as in David Lebovitz's Chocolate-Covered Caramelized Matzoh Crunch. As it's coming up to Christmas though, a white chocolate, pistachio and cranberry version seemed most appropriate. You could also try cutting these into triangles to make them more tree-like. Recipe similar to another one which appeared in Dish Magazine (Dec 2010/Jan 2011). Line a sponge roll tin with baking paper and place a single layer of Salada crackers in the bottom of the tin. In a saucepan, heat butter and sugar over medium heat and bring to a boil for 3 minutes. Pour over crackers. Bake at 180°C for 8 to 10 minutes. Remove from oven and sprinkle chocolate over the crackers as soon as pan comes out of the oven. Allow to melt (around 5 minutes), then evenly spread the chocolate with a knife. Sprinkle the pistachios and cranberries over the melted chocolate. Allow to cool and then break into pieces. What is a sponge roll tin? It is a rimmed baking sheet. If you don't have one, and end up using a rectangular cake tin as I did, you'll only be able to fit two-thirds of the crackers in, so you'll need to adjust the other ingredients accordingly. I only had a rectangular cake tin, which wasn't able to hold all the crackers. Can I use other kinds of chocolate? You can use compound milk chocolate instead of white chocolate, or even dark chocolate buttons, but I would advise against bittersweet chocolate with 65% cocoa or higher. You want the caramel flavour to shine in these toffee pieces, and a strong chocolate taste would overwhelm this. I also noticed that white chocolate seemed to have a lower volume than its browner counterpart, so you would need less of the milk chocolate in weight, say only 200-250g. Caramel poured on, and baked, then chocolate buttons melted over the top. How long do I need to cool this for after adding the toppings? It can take 2 to 3 hours for this to cool completely at room temperature, so that the chocolate fully sets. You can also also put this into the refrigerator to make it properly brittle before chopping. 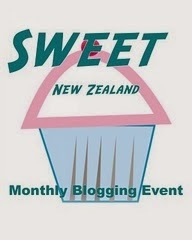 This post is part of Sweet New Zealand, a monthly blogging event for New Zealand bloggers to share something sweet. This month it is hosted by Mairi from Toast.